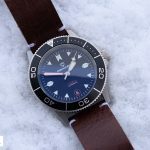 Published by Joshua Clare-Flagg on 24 Jan, 2019. 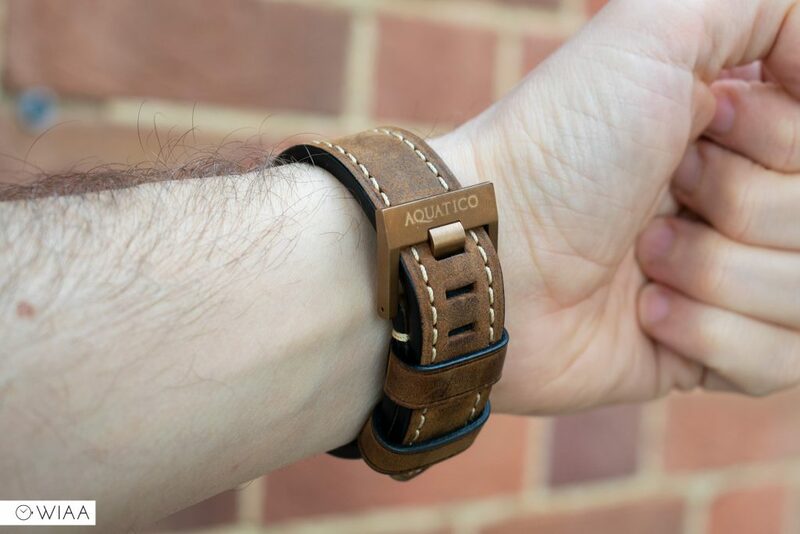 All the Aquatico watches I’ve reviewed (there’s a few) have proved to be solid watches for the money with impressive specs. The Bronze Sea Star looks to be no exception: a reasonable price tag of $299 / £235; offering 300m water resistance, Seiko NH35 movement and a solid bronze case. 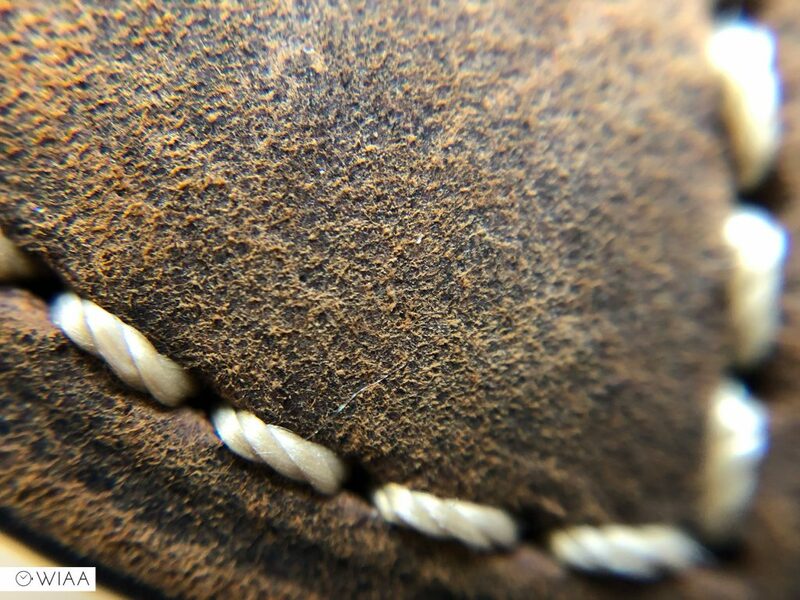 Let’s a closer look to see how it holds up. 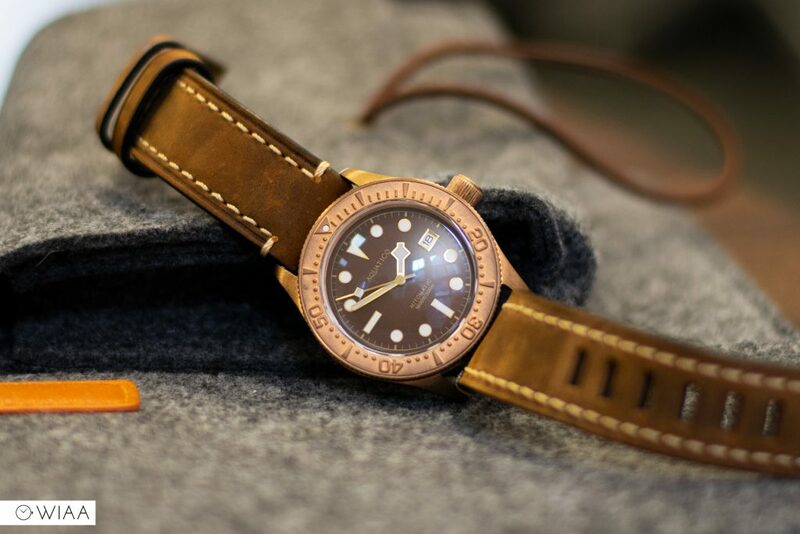 The primary feature of the Bronze Sea Star is – you’ve guessed it – the solid CuSn8 bronze used. The pictures you see have developed a lovely, gentle patina in the two months I’ve owned it. 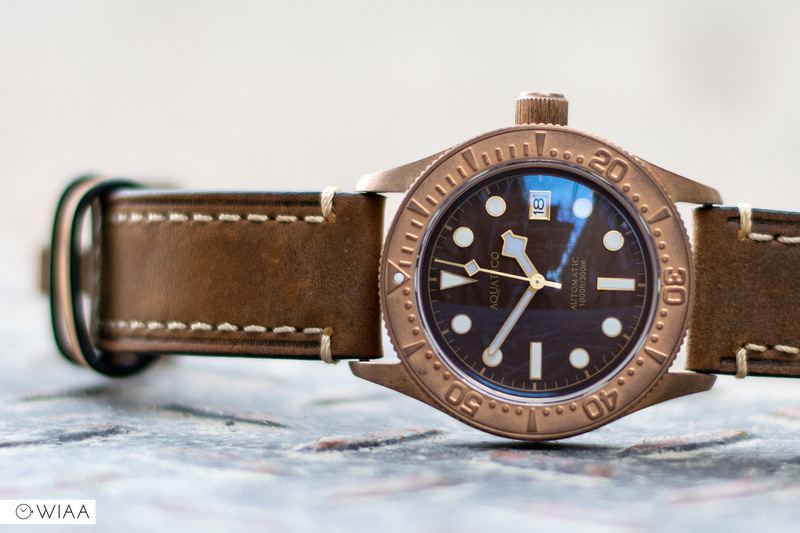 That’s the charismatic thing about bronze: it ends up being very unique; and when you want to start again just strip it back (Brasso or lemon water are two popular methods) and start again. 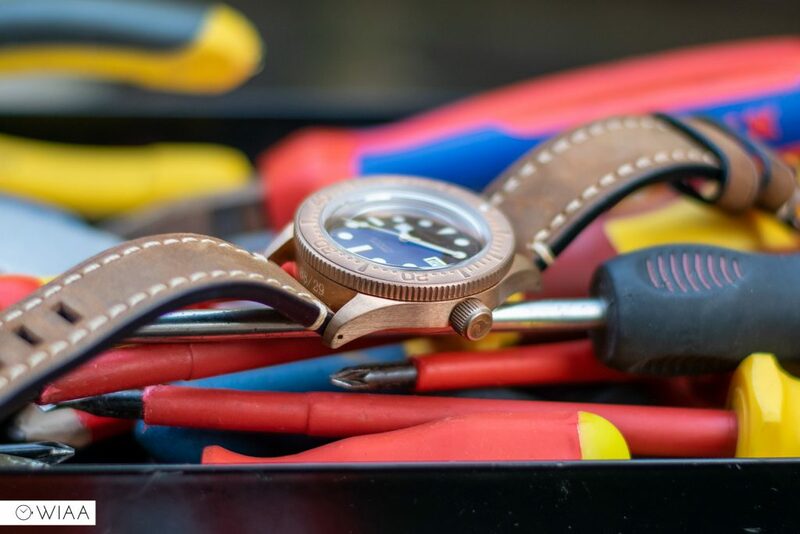 The finish of the case is completely brushed, so it’ll stand the rest of time. 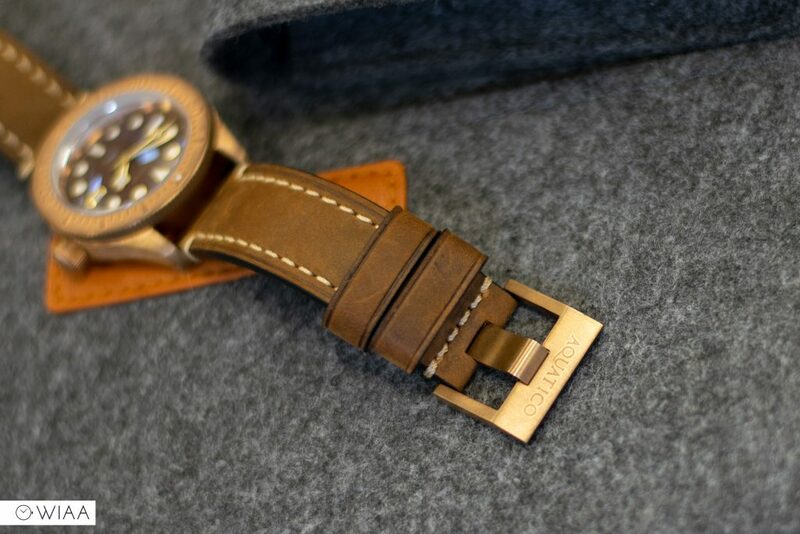 It’s a standard barrel shape, with the added bonus of drilled through lugs making switching straps easy. 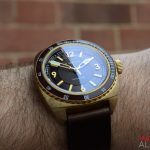 It’s an impressive size (fairly common for a deep diver) and hefty weight, giving it plenty of wrist presence. 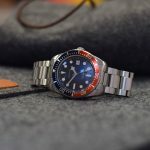 Another key feature is the 120-click bezel, with all the markings embossed accurately – it’s subtle yet easy to read due to the impressive depth of the details. 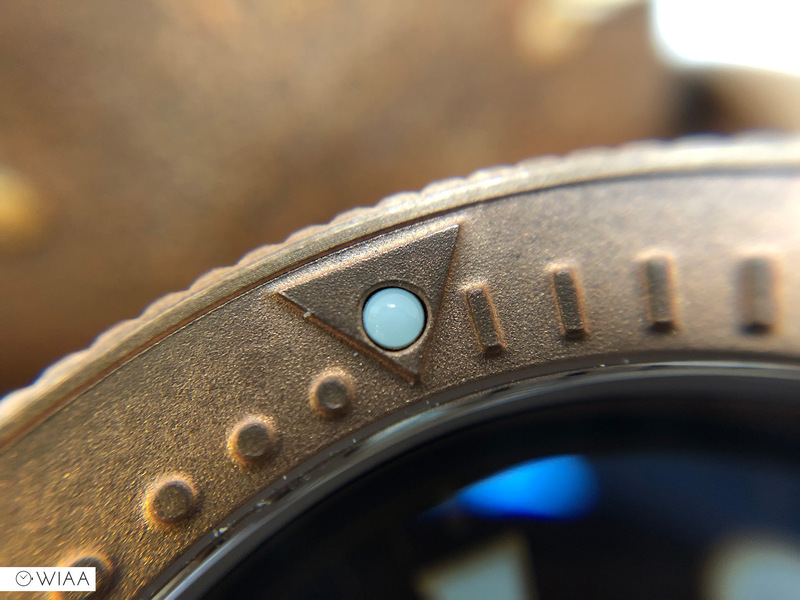 It also has a lumed pip at 12 within a triangle. Some backwards play is there, but it is minimal. 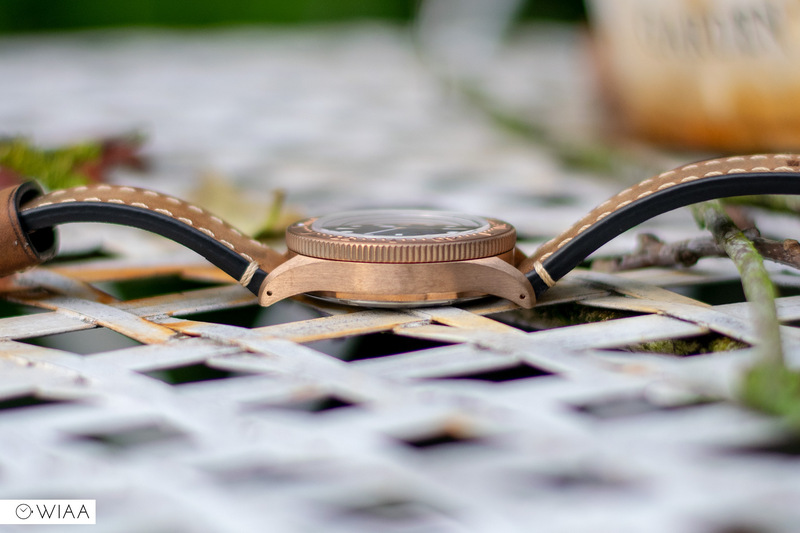 However, the primary issue I’ve noticed is the wiggle that exists when you push down on top of the bezel. 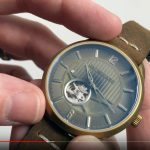 It doesn’t affect the smooth action, but it’s a shame that the tolerances aren’t tighter (watch the video review to see the wobble). 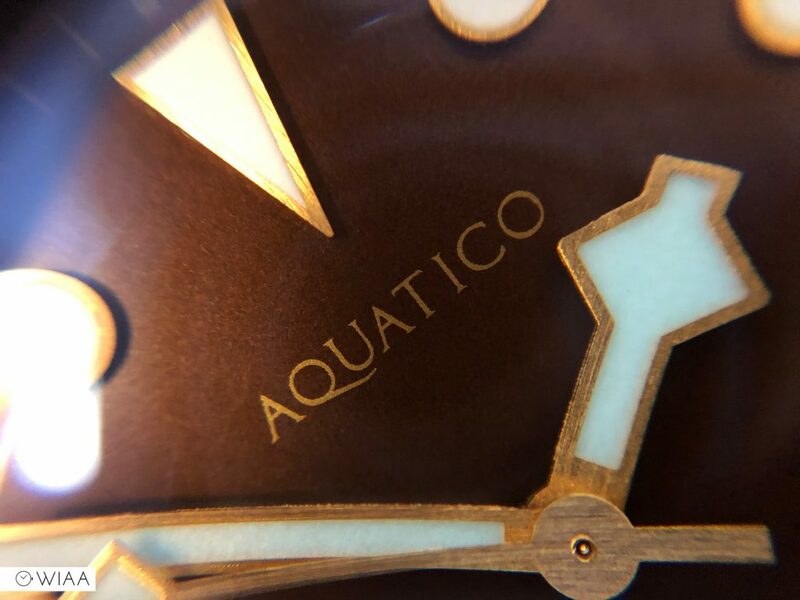 Sitting on top of the case is a mega highly domed sapphire crystal – it makes it a real pain to photograph and it’s also very reflective. You can tell it’s super thick from looking at it (which shows the quality), but the clarity is just not there. 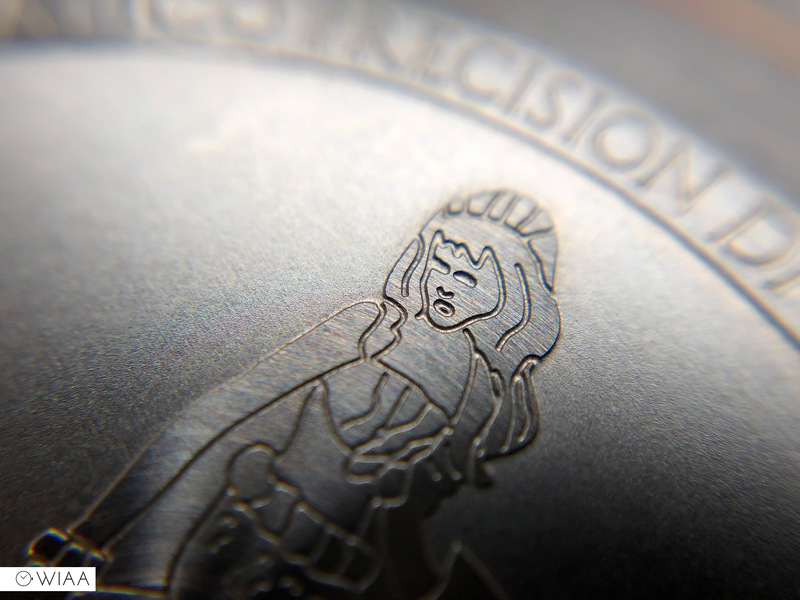 Another cool touch is the serial number laser etched between the bottom lugs. 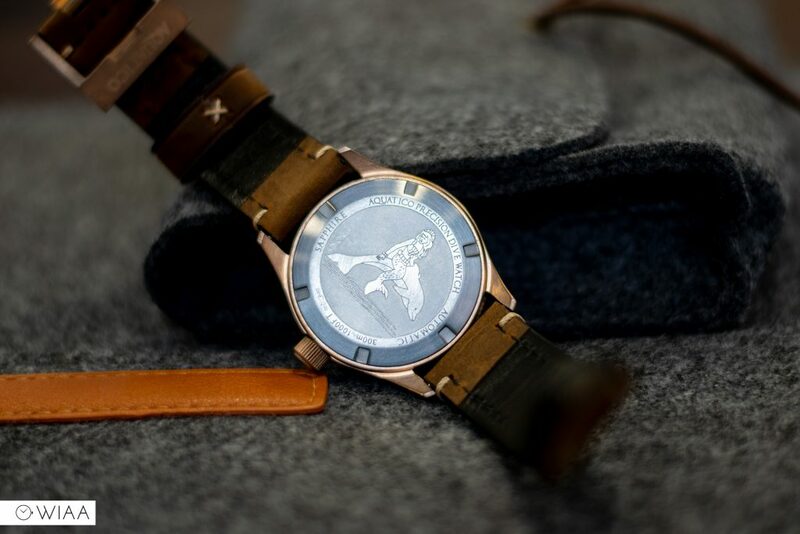 The screw-in crown has great grip and the dolphin logo embossed on the end. 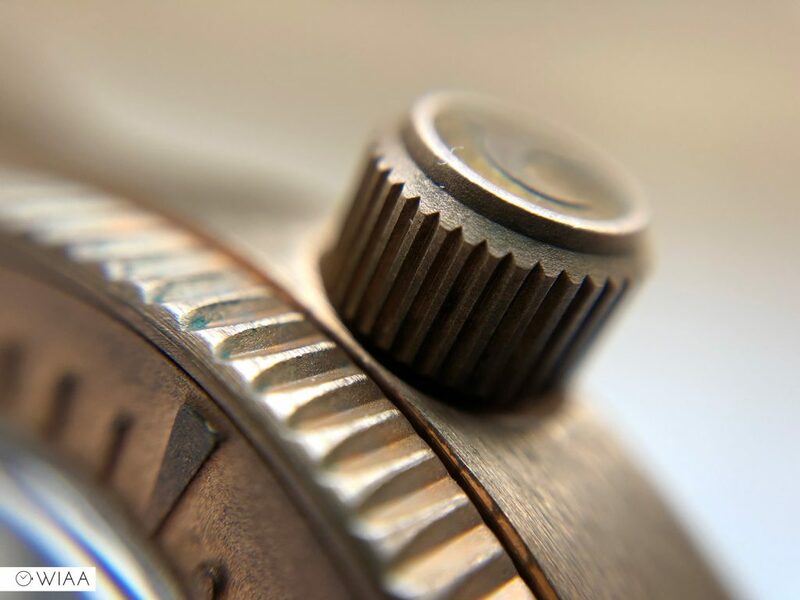 The thread is smooth so it’s easy to use, but I find the depth of the crown sticks out a little far, and it knocks off the case to crown ratio. Visually I would have preferred it to be a little bit more slender as it would make it a little more elegant. 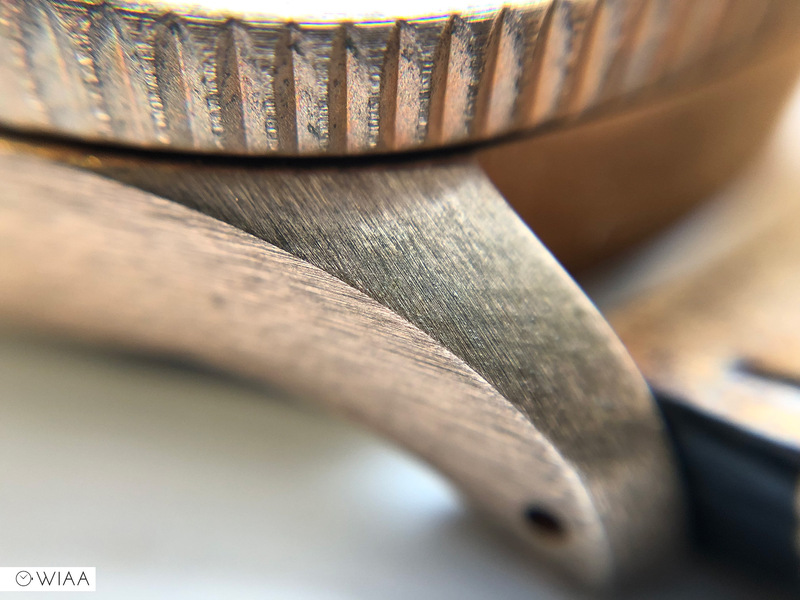 The screw-in caseback is stainless steel rather than bronze, which is a common occurrence as it stops them both seizing up (sometimes the bronze could oxidise so much that the caseback seals up to the case). 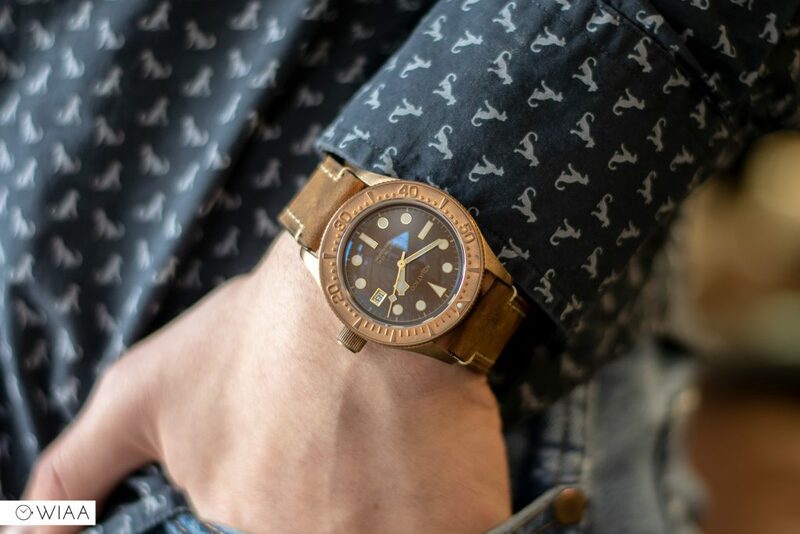 It features a drawing of a mermaid riding a dolphin, and although it’s a bit crude artistically, it’s well executed. 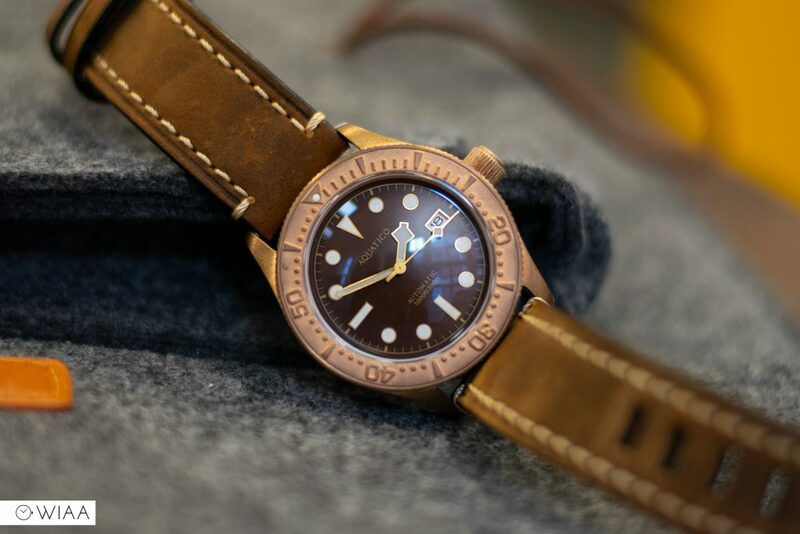 The dial comes in three colour options; this one being the brown. I think it works splendidly with the bronze, complimenting the colours perfectly. The brown is a delicious milk chocolate colour, very similar to the strap. In terms of design, it’s fairly classic: the main feature being the snowflake hands which always catch my eye. The hour markers are a standard layout, but I like the tall triangle at 12. 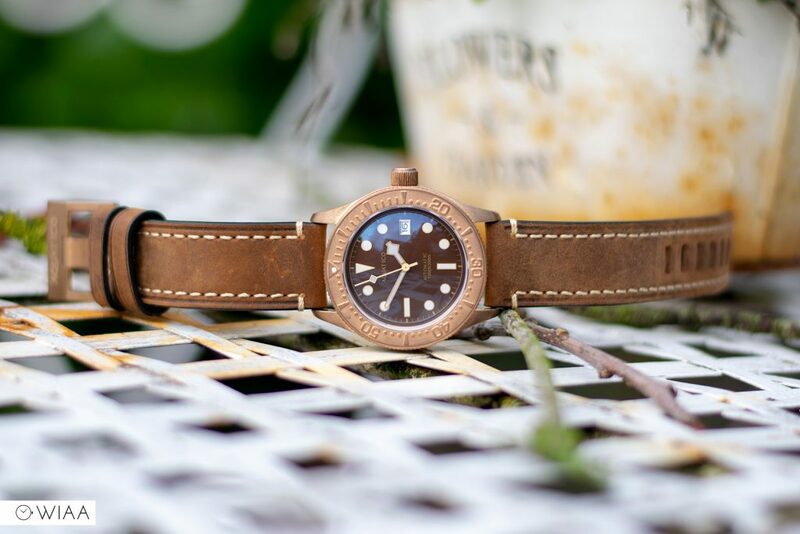 The hands and hour markers have a brushed bronze style border to them which looks good and is an effective offset against the brown dial base. 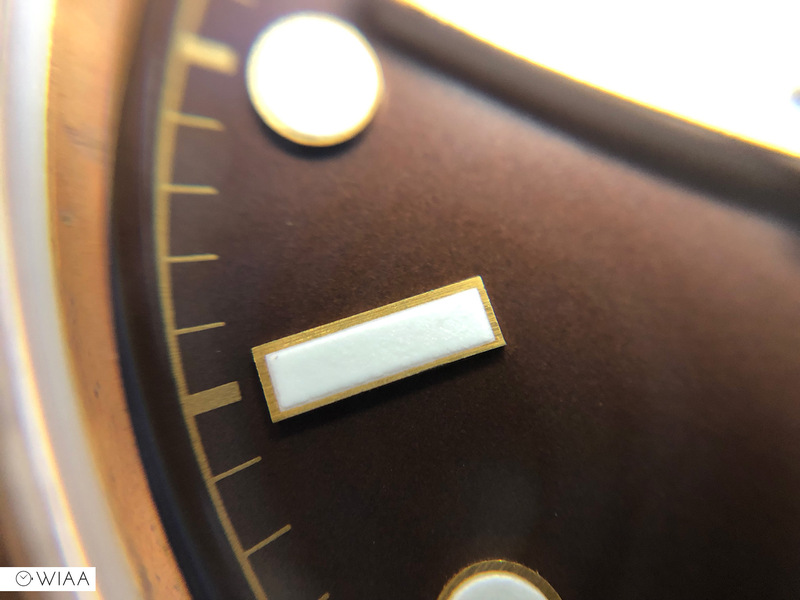 The gold plated border to the date window is surprisingly neat, and the white date wheel works out well alongside the white lume on the hour markers – so it doesn’t stick out like a sore thumb. The printwork is a light brown / gilt gold, which makes the text a little difficult to read – but as a positive, it keeps it subtle. 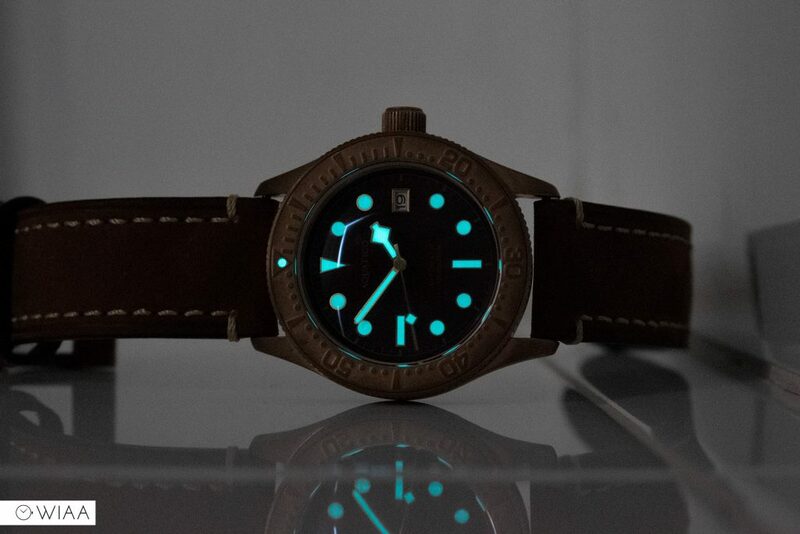 The hands and hour markers are all layered with BGW9 lume which is acceptable for the price of the watch. It’s not mind-blowing, but you can see it at work. 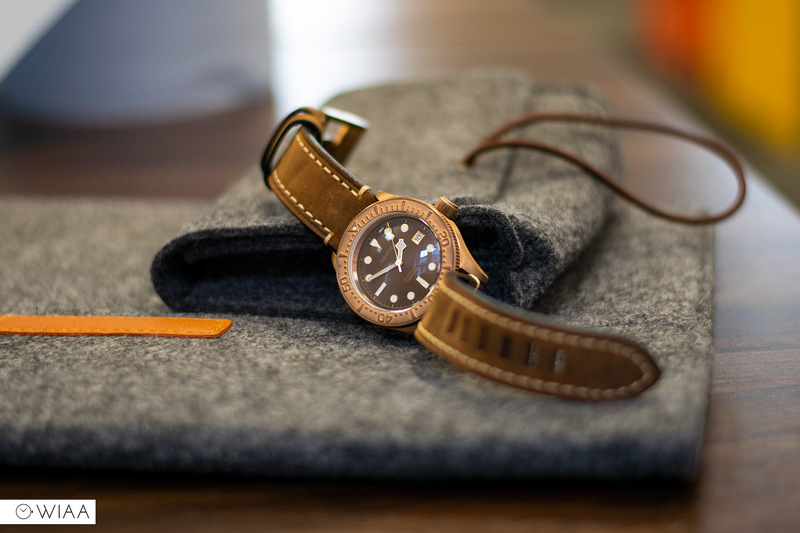 The strap is crafted by hand with Crazy horse leather. 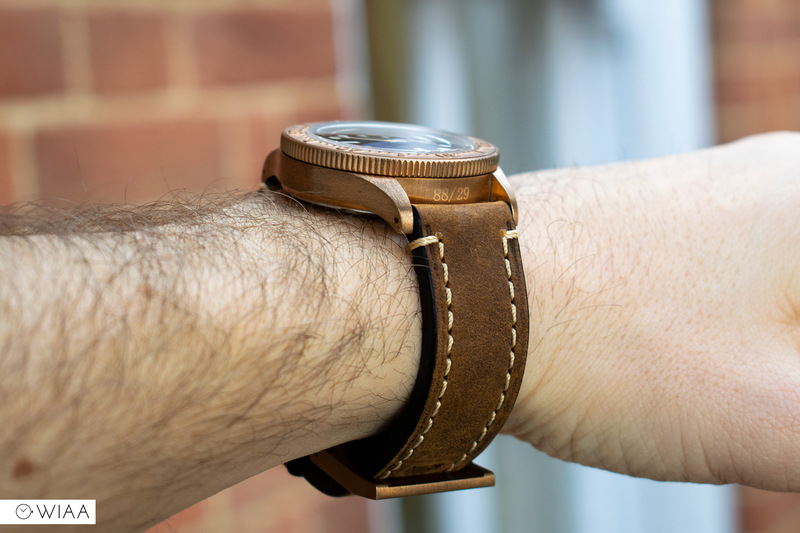 It has a lovely soft rustic finish to it and it’s well sealed along the edges, which also applies to the keeper loops. 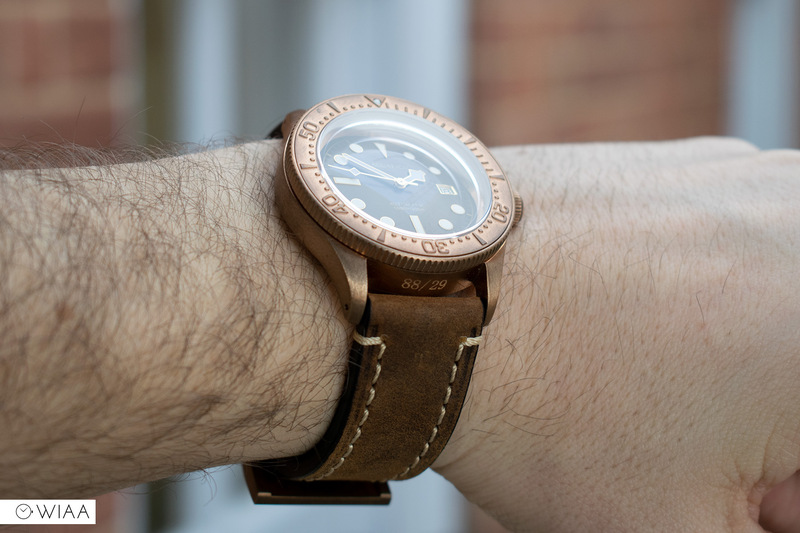 The brown colour compliments the bronze so well, and the thick cream stitching provides a contrast. The tang buckle tongue is extra wide, resulting in wide holes along the strap and a more aggressive look. It also feels super secure and is easy to use. 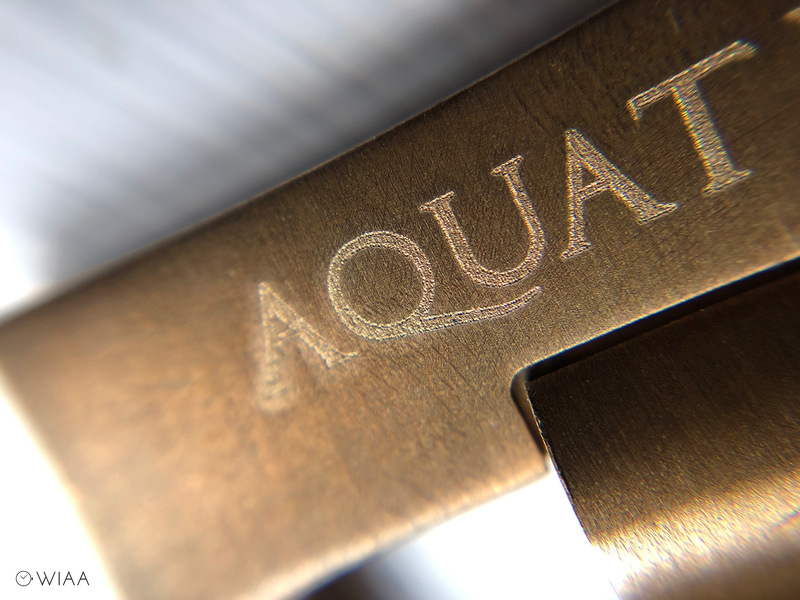 The buckle itself is rather square and aggressive in design, with an angled top bar with the Aquatico logo lightly laser etched on. 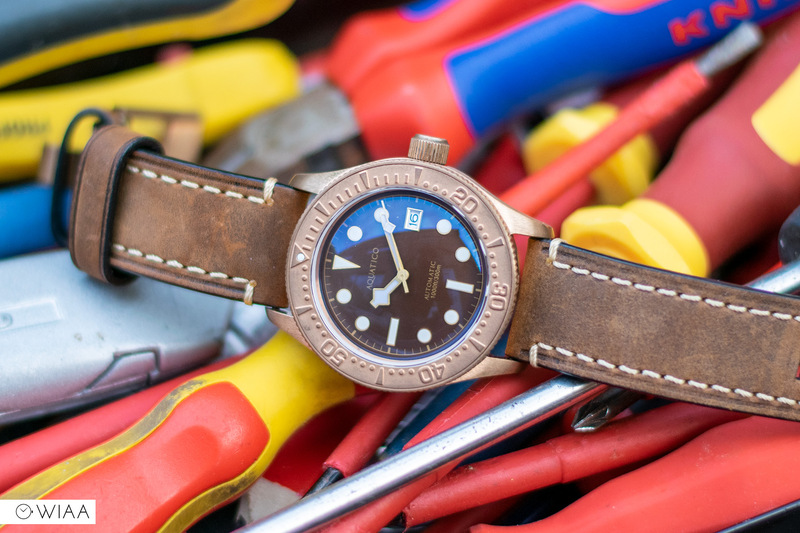 It’s a shame the logo isn’t engraved, as I’m sure that it’ll lose a lot of definition as the patina starts to sink in. 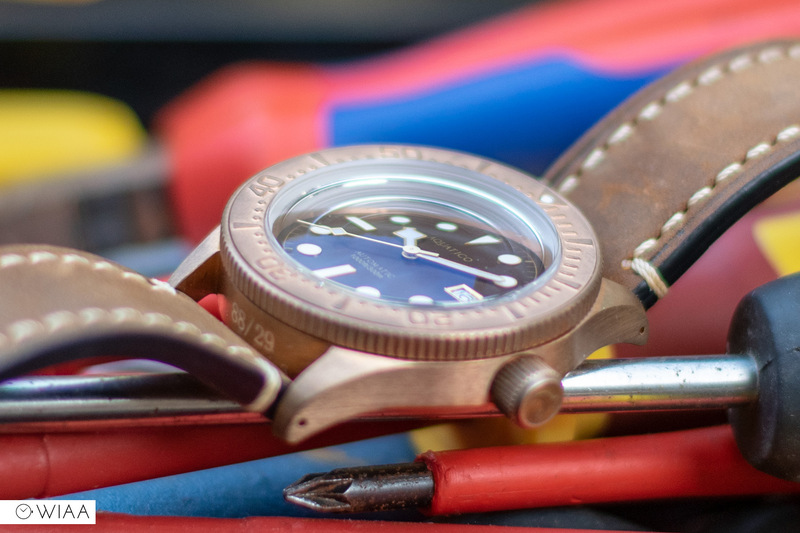 The movement powering the Aquatico Bronze Sea Star is the efficacious Seiko NH35. 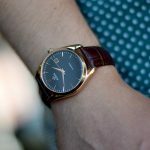 I see this movement so regularly it’s hard to keep writing about it as I’m always stating the same things: it’s dependable, cheap, and will run for years with very little maintenance. It’s fairly ugly, but as we’ve not got an exhibition window in the caseback, that’s not an issue. 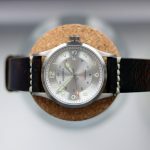 Specs include: running at a low beat of 21.6k bph (6 ticks a second), 24 jewels, 41-hour power reserve, hacking seconds, and hand and automatic winding. 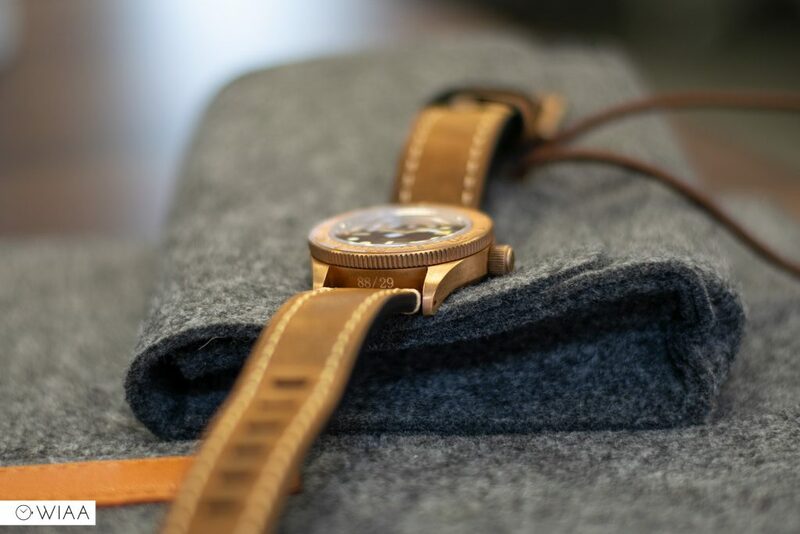 This one is coming in at an acceptable +9.6 seconds a day – I like my mechanical watches to be within 10 seconds out. 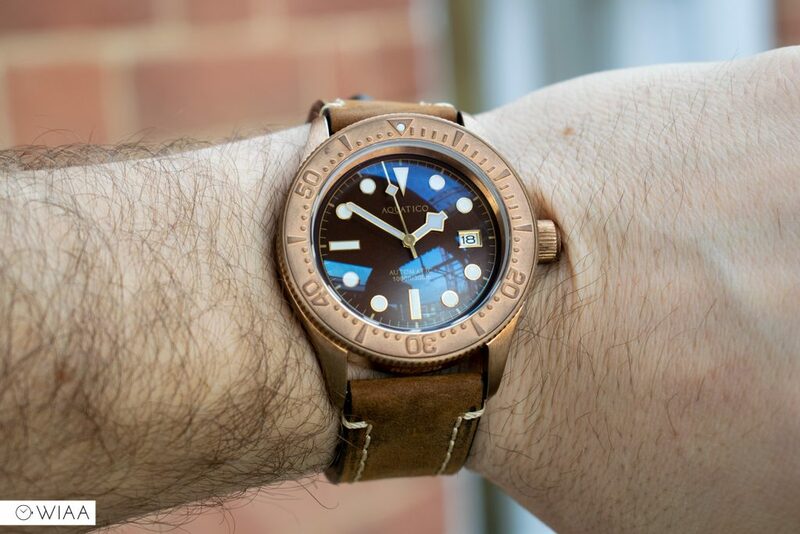 There’s no doubt about it, the Aquatico Bronze Sea Star is a lot of watch for the money, even with its flaws. 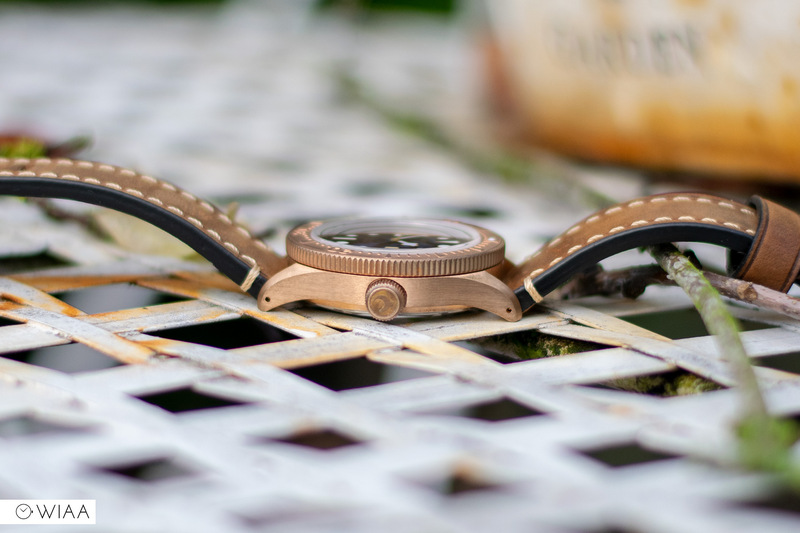 The bronze case is beautiful; especially the bezel – however that little bit of wiggle is a shame. 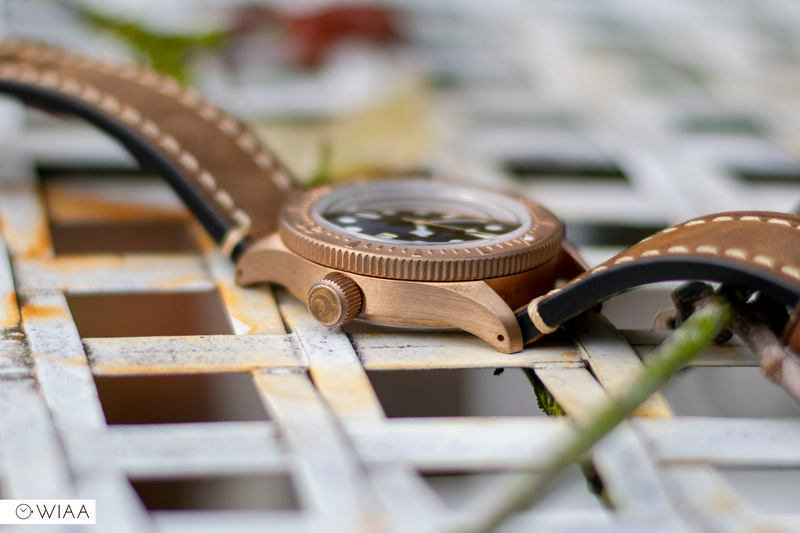 The water resistance and movement are as good as you can get at this price; so is the succulent leather strap. 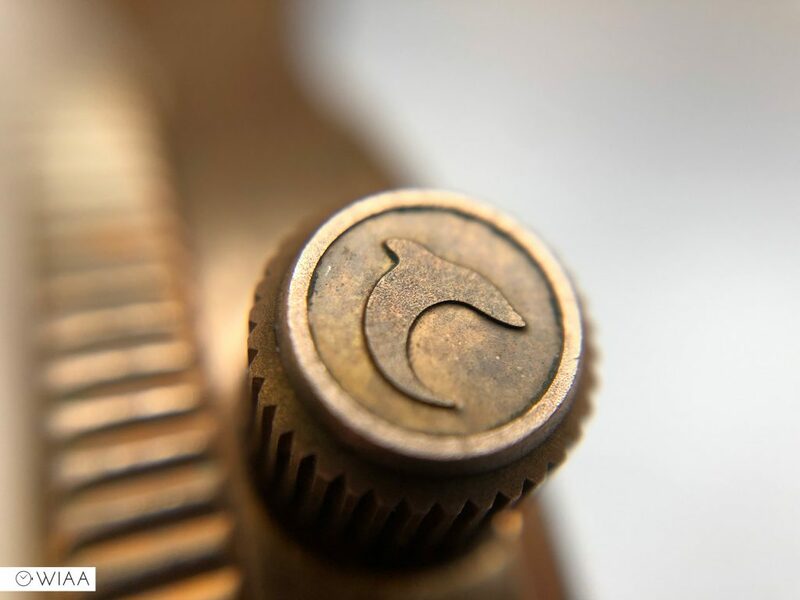 My other criticisms are the depth of the crown (visually I think it could be a bit smaller) and the logo on the buckle – I would have liked that to be engraved rather than laser etched. Whilst the sapphire crystal is supremely thick and looks like it could take a hammer to it, the anti-reflection abilities leave much to be desired. 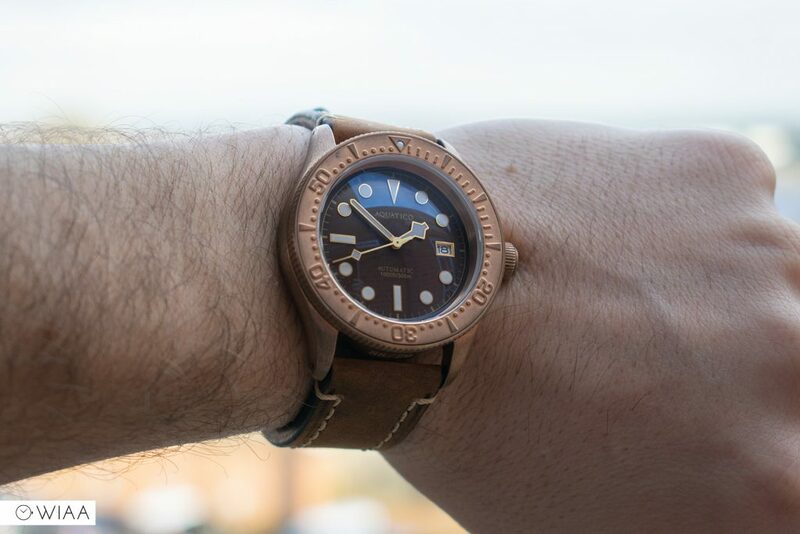 Saying that, despite the flaws, I still think it’s a great watch for the money. 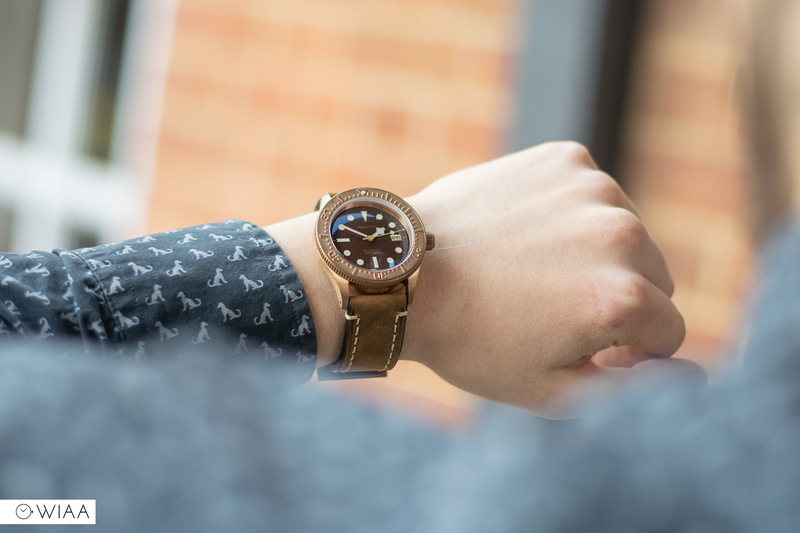 There’s certainly a spike in popularity with bronze watches at the moment – and the Aquatico Bronze Sea Star is a great option for you to consider.